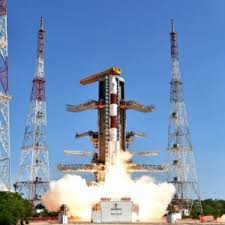 PSLV-C35, ISRO's Polar Satellite Launch Vehicle, on Monday successfully launched the 371-kg SCATSAT-1 satellite along with seven co-passenger satellites from Satish Dhawan Space Centre SHAR, Sriharikota. This is the 36th consecutive successful mission of PSLV. The total weight of all the eight satellites carried on-board PSLV-C35 was 675 kg. PSLV-C35 is the first PSLV mission to launch satellites carried onboard into two different orbits. This mission was the longest of the PSLV missions conducted till date and was completed in 2 hours 15 minutes and 33 seconds after lift-off. After PSLV-C35 lift-off at 9:12 am IST from the first launch pad with the ignition of the first stage, the subsequent important flight events, namely, strap-on ignitions and separations, first stage separation, second stage ignition, payload fairing separation, second stage separation, third stage ignition and separation, fourth stage ignition and cut-off, took place as planned. After a flight of 16 minutes 56 seconds, the vehicle achieved a polar Sun Synchronous Orbit of 724 km inclined at an angle of 98.1 degree to the equator (very close to the intended orbit) and 37 seconds later the primary satellite SCATSAT-1 was separated from the PSLV fourth stage. After separation, the two solar arrays of SCATSAT-1 satellite were deployed automatically and ISRO's Telemetry, Tracking and Command Network (ISTRAC) at Bengaluru took over the control of the satellite. In the coming days, the satellite will be brought to its final operational configuration following which it will begin to provide weather related services using its scatterometer payload. The data sent by SCATSAT-1 satellite will help provide weather forecasting services to user communities through the generation of wind vector products as well as cyclone detection and tracking. After the successful separation of SCATSAT-1, the PSLV-C35 mission continued. With the seven co-passenger satellites, the fourth stage of PSLV coasted over the South polar region and then started ascending towards the Northern hemisphere. A safe distance between the orbiting SCATSAT-1 and PSLV-C35 fourth stage was maintained by suitably manoeuvring the stage. The importance of having access and connections to one will be explained below. The different kinds of lenses often come with different coatings and other features that help to make them more appropriate to the needs of the consumer. I have visited your blog,I have also a blog which is related with you, which is about scatterometry. Other smaller shrink-wrap systems package CDs, DVDs, and software for shipment. The larger shrink wrap systems are electronic and can package letters, boxes, books, industrial equipment and even traffic signals.